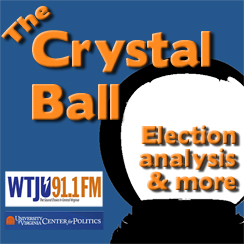 The Crystal Ball brings you weekly political analysis from the UVA Center for Politics. From the conventions to Election Day, The Crystal Ball features clear-eyed election news, analysis, and projections in a concise package. This program is FREE to stations. The 3.5 minute segment is ideal for the Hour 2 ATC cutaway on Mondays or for a Segment C cutaway in the Tuesday Morning Edition. It can also stand on its own as a self-contained segment.